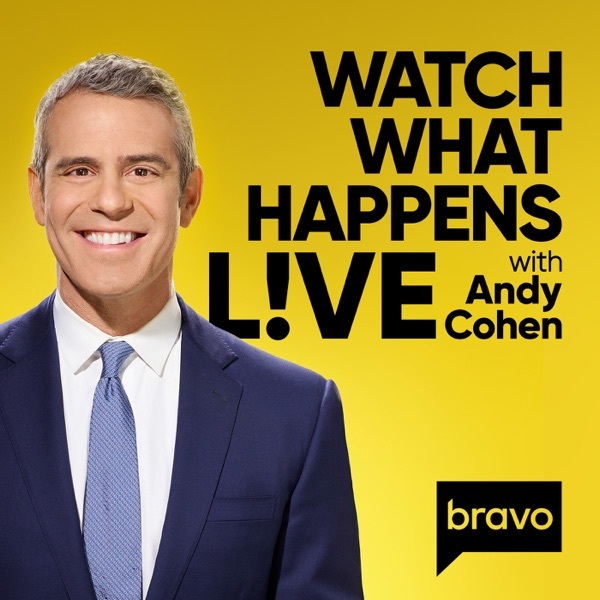 Watch What Happens Live with Andy Cohen | Listen Free on Castbox. Every night, Watch What Happens Live with Andy Cohen brings you lively conversations about everything in the world of entertainment, politics, and pop culture. Now, get that same dose of celebrity (and Bravolebrity) fun as a podcast! Subscribe to hear every episode, plus the live after show and exclusive behind-the-scenes content. Anna Faris & Nina Garcia join host Andy Cohen. Listen to lively debates on everything from the latest drama surrounding your favorite Bravolebrities to what celebrity is making headlines that week live from the WWHL clubhouse.Aired on 04/18/19Watch clips and see photos at BravoTV.com. Dorinda Medley & Kristin Cavallari join host Andy Cohen. Listen to lively debates on everything from the latest drama surrounding your favorite Bravolebrities to what celebrity is making headlines that week live from the WWHL clubhouse.Aired on 04/17/19Watch clips and see photos at BravoTV.com. Ciara & Lisa Rinna join host Andy Cohen. Listen to lively debates on everything from the latest drama surrounding your favorite Bravolebrities to what celebrity is making headlines that week live from the WWHL clubhouse.Aired on 04/16/19Watch clips and see photos at BravoTV.com. Lala Kent & Ariana Madix join host Andy Cohen. Listen to lively debates on everything from the latest drama surrounding your favorite Bravolebrities to what celebrity is making headlines that week live from the WWHL clubhouse.Aired on 04/15/19Watch clips and see photos at BravoTV.com. Eva Marcille & Miss Lawrence join host Andy Cohen. Listen to lively debates on everything from the latest drama surrounding your favorite Bravolebrities to what celebrity is making headlines that week live from the WWHL clubhouse.Aired on 04/14/19Watch clips and see photos at BravoTV.com. Melissa Etheridge & Chelsea Handler join host Andy Cohen. Listen to lively debates on everything from the latest drama surrounding your favorite Bravolebrities to what celebrity is making headlines that week live from the WWHL clubhouse.Aired on 04/11/19Watch clips and see photos at BravoTV.com. Bethenny Frankel & Brandon Maxwell join host Andy Cohen. Listen to lively debates on everything from the latest drama surrounding your favorite Bravolebrities to what celebrity is making headlines that week live from the WWHL clubhouse.Aired on 04/10/19Watch clips and see photos at BravoTV.com. Lisa Vanderpump joins host Andy Cohen. Listen to lively debates on everything from the latest drama surrounding your favorite Bravolebrities to what celebrity is making headlines that week live from the WWHL clubhouse.Aired on 04/09/19Watch clips and see photos at BravoTV.com. Brittany Cartwright & Jax Taylor join host Andy Cohen. Listen to lively debates on everything from the latest drama surrounding your favorite Bravolebrities to what celebrity is making headlines that week live from the WWHL clubhouse.Aired on 04/08/19Watch clips and see photos at BravoTV.com. Tamar Braxton & Lizzo join host Andy Cohen. Listen to lively debates on everything from the latest drama surrounding your favorite Bravolebrities to what celebrity is making headlines that week live from the WWHL clubhouse.Aired on 04/07/19Watch clips and see photos at BravoTV.com. I love your intros Andy!! !